Previous article:#eastcoastwearehere: Chinese Junkboat Tour leaves us "hungering" for more Next article:#eastcoastwearehere: Life's a beach! The blow signals that a whale watching show is about to begin. Sometimes. We were lucky. 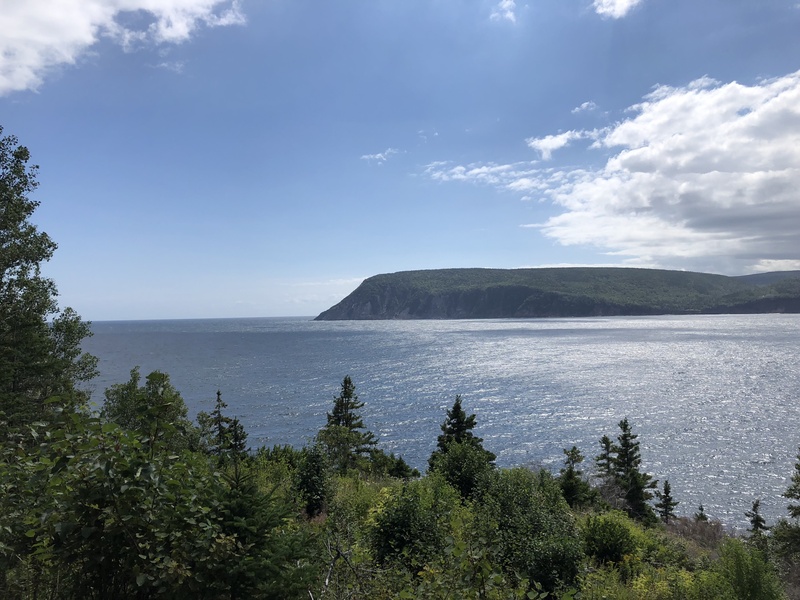 The view during our hike in Cape Breton Highlands National Park. 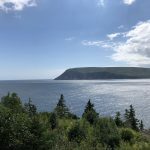 September 2, Ingonish Beach, Cape Breton Island, Nova Scotia — There’s no doubt that the best things happened when we least expected them on our tour along the Cabot Trail. Such was the day we retraced our steps along the southeastern shore, without a plan or even a place to stay. That’s not entirely true. 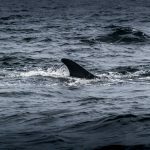 Unable to restrain myself, I had called and scheduled an afternoon whale watching tour in Pleasant Bay, which was about 3 hours away on the northeastern side of the trail. We had just arrived in Ingonish Beach and stopped to snap some photos in the harbour when we saw people donning life jackets. I walked over and learned that a Zodiac whale watching tour was just setting off. 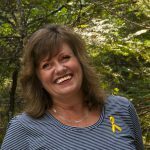 William McNichol of Ingonish Zodiac Adventures, read me like a book, not tolerating my hesitancy, fears or need to stick to the “schedule”. He told me point blank I had to make a decision “right now!” My partner Mike was more surprised than anyone when I turned to him and said, “Let’s do it!” Knowing the weather could turn and the wind could come up I realized this might be our only chance and whale watching was definitely at the top of my Cabot Trail bucket list. Captain Kinnon MacKinnon was our guide on this glorious, windy day. As we boarded the Zodiac, I snuck into a seat at the back where I figured I could hang on for dear life to a bar that was much like the ones you see on ferris wheels. Fearless Mike headed to the front of the boat, camera in tow. I then heard him tell the captain, “There’s room for a wife up here” to which captain, Kinnon MacKinnon, responded, “Wife to the front!” It was a hilarious start to a very memorable hour. A little tongue tied along with my Zodiac mates awaiting the big sighting. The Zodiac took off and after I hadn’t fallen out in the first 10 minutes I relaxed realizing I likely wasn’t going to. I leaned into the joy of bouncing along in the swells. I tried to take pictures with my iPhone but it was jammed and with only one hand free to fix it (I was still hanging on for dear life), I put it away. William had given Mike a blanket for his camera, which was needed when the waves came over the side of the boat a few times. Kinnon was a pro though having done this for a while, steering us effortlessly through the swells. 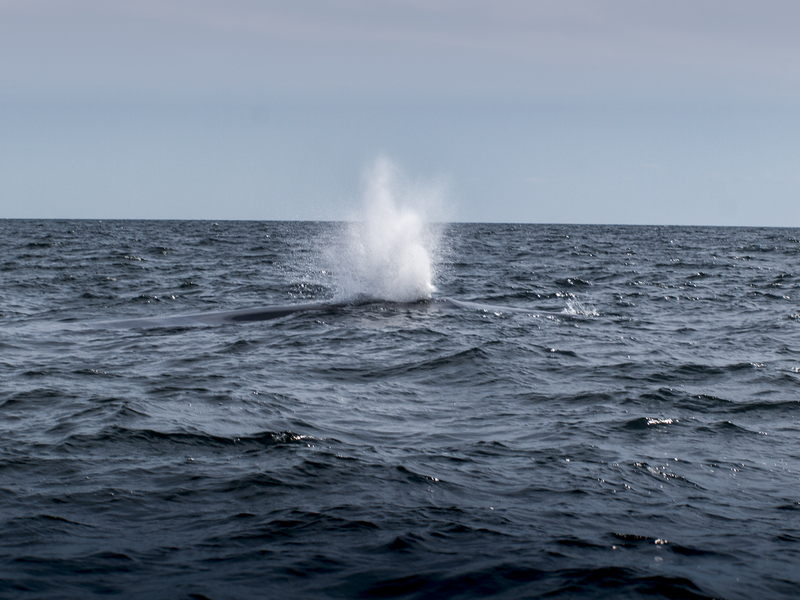 We eventually arrived at the location where a fin whale had been spotted by a boat that departed as we came along. 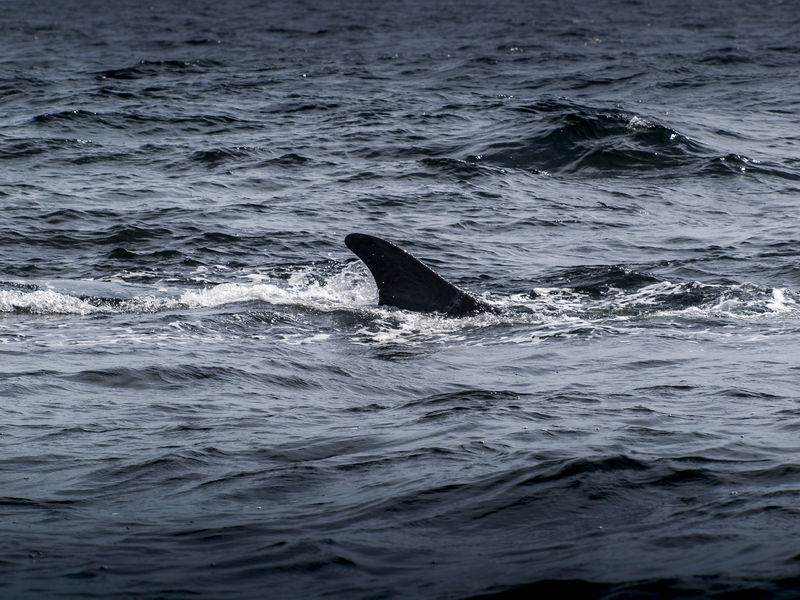 It soon became clear to us that the boat operators all communicate with one another about the sightings. This company boasts a very high sighting success rate – over 95% – and one of the best in Atlantic Canada according to its website. I was getting worried when we hadn’t seen anything after some time, thinking just my luck. Then Mike spotted the “blow” as we’d been instructed to watch for. We headed for it, while Kinnon said that it might be another 8 to 12 minutes or so until the whale surfaced again. We waited. And waited and it was closer to 15 minutes when I spotted the second blow. The Zodiac eased up to this location and it was now time for a show as she (“it” became a “she” at this point) blew again upon our approach. Not long after, we got to see pretty much all of that 85 feet. Grace. That’s all I could think as she pushed her massive, gleaming body through the water barely making waves. There were some gasp from our side but the only other noise was the whale’s swoosh through the water and deep puffs as she blew again. 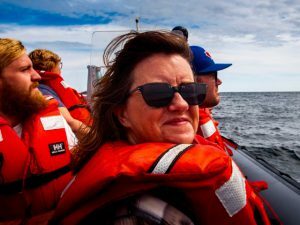 When she moved to within about 20 feet of us, heading to starboard, the young woman next to me whispered, “Where’s she going?” but there was no fear. Only admiration and wonder to be a part of this. After her last push, she disappeared bit by bit under the surface, turning the choppy water flat in the wake of her large tale as she headed downward. All 85 feet of her. Our captain broke the silence then, saying simply, “Well that was one great sighting.” Despite the fact he does this all day, it didn’t seem to be “old” even for him. I wobbled back to the car, perhaps due to having to get my land legs back. Or just because I’d lost my footing, knowing I’d seen something that would stay with me for a very long time. As it turned out, the wind was furious on the northeastern shore so this was a lucky break. I didn’t really need anything else on this day. Next group of whale watchers on the way!